A bit of a goal, a bit of an experiment for me in 2016 – less Social Media in my life! Last year I was feeling stressed and realized the feeling was largely due to too many things vying for my attention. Even little things (like an email notification of a response to a social media post) that were easy enough to ignore or quickly dismiss, would take some time from my consciousness and distract me. A few seconds here and a few seconds there can add up, and especially if you think you’ve dismissed something, but the thought remains being bounced around in your brain. So no doubt there has been value in social media participation but still there are the costs: my time and my serenity. So starting on 2016 January 1st, I will not be posting to Twitter, Facebook or Google+. I expect to return to these platforms someday but as I start this experiment I don’t know when that will be. I like the idea of going the whole year but concede that I might be back in two weeks. Whenever the experiment ends I hope I will have learned something and that my future use of social media will be more productive and less of a crutch and time-waster. On future post I will share what I am learning from this experiment – hopefully something of value to me and perhaps others. I recently listened to a thought provoking and inspiring talk, the closing keynote to the APCO Canada 2014 Conference in Vancouver on 2014 November 6. Always ask yourself “What can we/I do?” In other words don’t sit back (perhaps complain) and wait for someone else to take action to resolve an issue. “Do something, do anything“. However small the action may be and even it is just to get together with others to discuss what you can collectively do – take action! Stepping up and taking action can lead to a ripple that leads others to act. Just by taking the initiative, your actions can be multiplied beyond what you thought you could accomplish alone. Dr. John Izzo has written six books including his latest “Stepping Up”, which was the basis for the inspiring talk at APCO Canada. Having started 2012 with a goal to get my own business going (in a serious way) I have been looking for advice. One source of advice that I like are books and there are a couple that I have found particularly useful. I will discuss one of those here. I recently finished listening to the audiobook of The Entrepreneur Equation by Carol Roth. It was eye-opening, addressing the question of not can you be an entrepreneur but “should” you be. The book is filled with warnings. While many books on the topic address what a budding entrepreneur should do, it would seem this book is intent on dissuading the reader/listener from going into business. That is probably not exactly true but it does ensure that one would be going into the endeavor with their eyes wide open. The Entrepreneur Equation addresses the myth of the “American Dream” and what it is really like to be running one’s own business. The book certainly dispels some romantic assumptions such as having freedom and time to pursue one’s passion – the reality is that you are going to be running a business and can expect to be consumed by business activities – probably a lot more than by activities directly related to your passion. In the early part of the book, I questioned whether it was for me or if I even shared the definition of what a business is. I found myself disagreeing with what Roth said the goal of the business should be. She puts down, as a “jobby”, endeavors which are basically a one-person business. A jobby is a job-hobby – a job created to allow the owner to pursue his/her hobby. I got the impression that Roth’s book was addressing big (or at least potentially big) business and saying that the only reason to be an entrepreneur is to create a business so you can build it’s value and sell it. A business that relies solely on the owner and the owner’s talents would have no value without that owner, hence can not be sold and has no intrinsic value and should not be pursued. Since this jobby-type of business is what I am interested in, I was almost ready stop listening right there. I did persevere and am glad I did. The remainder of the book was still of value as a reminder of what one must be prepared for – in any sort of business undertaking. To hear/see author Carol Roth talk about her book, check out this YouTube video. The second book which I recommend for anyone considering starting a business, is “The E-Myth Revisited” by Michael E. Gerber. This book also serves to open one’s eyes to the realities of running a business but I will say more about in a future post. Have you read “The Entrepreneur Equation”? What do you think about it? Have you ever had one of those days – you know, when you are soooo busy that you’ve been running from meeting to meeting, squeezing in reading, analysis and writing to meet a deadline (or two). You’ve barely taken a break and end up eating lunch at your desk while plugging away. Of course the day also included a few “quick” questions via e-mail, phones calls and people stopping by your desk. By quitting time you feel you’ve had it – but you take few “minutes” more to finish up that last thing you were working on. You are fatigued! As you finish off that last item and get ready to go you notice a few pieces of paper around your desk that you didn’t have time to file away, as you quickly jumped from one appointment to the next all day. Maybe there are also a couple of binders open on your desk – you had found some information you’d been looking for, but hadn’t got pulled away before actually reading it. You tell yourself that you may as well leave those binders right where they are, so in the morning (“first thing in the morning”) you can pick up where you left off and read that information. Maybe you also notice 30 e-mails you had received during the day that you don’t really need and should delete from you inbox or at least move to an archive folder. Oh yah, there are also half a dozen mental notes you mad during the day that you intend to add to your task list. But you are wiped out, exhausted – do you hang around for another 10 or 15 minutes to clean up all this debris, knowing that the 15 minutes will likely turn into 30 minutes given your fatigue-reduced efficiencies (not to mention potential distractions and sidetracks). Or, do you just call it a day, crawl out the door and count on tomorrow being less manic. Okay, and tomorrow is not less crazy – it’s another day just the same and you end the day in exhaustion with another pile of papers and e-mails to file away and that binder still sitting open on the corner of your desk. You again walk away exhausted at the end of the day with the best intentions of cleaning up tomorrow. And so it goes, day after day – you realize these aren’t “busier” days, theses are the norm. Unfortunately your normal response has been not to take the 15 minutes at the end of the day to put your workspace in order and not surprisingly that clutter ends up reducing you’re efficiency and compounding the problem! Maybe you rationalize that things will eventually slow down, some condition which has been causing the craziness fill be alleviated. At worst you tell yourself that come the summer, things will slow down and then you will get caught up and organized again (and then you will never let it happen again). So let s do the math – how much will things have to slowdown, how much free time will you need in order to clear up the back log from the daily 15 minutes that you did not put in? Just 15 minutes per day adds up, never mind the compounding effect of the cost of being disorganized. If you decided to clean up at the the end of the week, say by coming into the office on Saturday, you are looking at an hour and a quarter – okay, that’s manageable but add in commuting time to and from the office and you’ve probably wiped out half of your Saturday – so maybe that’s not so attractive to you and you don’t take that option. If you played catch-up once a month you are looking at 5 solid hours (at least) of reviewing papers, re-reading old e-mails and making a decision on each of those items. If you adopt the approach of waiting for that quiet time “in summer” to get caught up for the year – well your 15 minutes per day has now accumulated to 60 hours! If you did absolutely nothing but deal with your “end-of-the-day” filing backlog you would need a week and a half. Realistically you are probably talking about 2 solid weeks, IF you could turn off the tap of your normal daily work flow – sure it might slow down but go completely away for two weeks – it is not going to happen! At this point you are probably expecting me to deliver the big solution – but I don’t have one – not an easy, universal one. The starting point is to recognize the hole that you will be digging for yourself by deferring a necessary daily activity. Depending on the cause you may need assistance, better processes, to become better at saying no, different office hours etc. Look for your root causes but don’t overlook the reality that a simple 10 or 15 minute activity deferred can add up to a big demoralizing efficiency-robbing, hard-to-get-out-of situation. Have you been in this situation? Do you have any solutions to share, that worked for you? This week I’ve been listening to an audiobook Accidental Genius, Using Writing to Generate Your Best Ideas, Insight, and Content, by Mark Levy. The title and description caught my eye and by the time I’d listened to the introduction I was saying to myself “this is going to be good; this is what I need!” I have long wanted to be a better writer and to write more and by following the suggestions and exercises in this book I am confident I will achieve those goals. The basic premise of the book is built around the activity of “free writing” (what the author had called private writing in the first edition of the book). Free writing is an unstructured, uncensored, unedited flow of your thoughts to paper or keyboard. The idea may be nothing new – it sounds similar to the practice of daily jounalling or the “morning pages” that I heard about in Julia Cameron’s book The Artist Way. Levy contends (and I believe) that we have enormous creativity and answers to problems with in us. The trick is to draw them out of us so we can discover and use them. This book breaks down some simple techniques for doing just that. The insights gained through these practices will be of value whether one wants to solve business problems or actually produce “writing” – anywwhere on the continuum from a blog to a novel. I have just listened to this book once but I recommend it. I will soon start a second listen as I begin my own daily free writing practice. I am also giving thought to picking up a hard copy of the book for easier reference. For more info, visit this link for the Fast Company blog/Interview with Mark Levy about the book. Hear and see the author, Mark Levy, himself describe his book in this 3 minute YouTube video. Are you a regular writer? Have you read/listened to this book – what do you think about it? I love languages – different languages – the fact that there are different languages. Languages not only have different sounds for the same objects or action but in some way they represent different ways of looking at the world. The thought, that in shifting ones mind from one language base to another, might give a different perspective on the world is fascinating to me. Over the years I have studied French, German, Italian, Mandarin and Arabic. I have recently begun to learn Spanish. Along the way I have also picked up books on the Russian and Hawaiian languages. Of all of these languages, the only one I would claim even an intermediate capability with is French, and I still dream of some day achieving a moderate level of fluency in it. The reason I bring up the topic of languages is because I came upon a great resource that I want to share. When I was learning French, on my own, years ago, I had purchased courses (on cassette tapes!) from Audio-Forum. Their programs were a packaging of the courses developed by U. S. Foreign Service Institute (FSI) primarily for their diplomatic corp. These courses were pretty dry compared to today’s multimedia offerings, but they are thorough and I believe effective. The FSI courses rely on a lot of repetition of key sentence patterns, which are introduced through conversational situations. I was thrilled to have recently heard about, and today confirmed, that these FSI Language Courses are available online – for free! These courses are made available by a non-profit, non-governmental group. The instructional material itself is public domain. There are over 40 languages available including all the major world languages and a few that I have never heard of. The courses include the audio of the programs which is essential for the “listen and repeat” strategy of the program and also PDF versions of the printed manuals for acquiring written language capability. The audio does not seem to be downloadable but can be played through a web browser. The courses may have been developed decades ago so some of the vocabulary may be a little dated but I’m sure once you’ve mastered the bones of the language, you can pick up the latest vocabulary without trouble. There are in fact three FSI Spanish courses available: Programmatic, Basic and FAST as well as some regional quick-start guides. I am using the Basic Spanish course right now to supplement the Pimsleur course that I have started. As alluded to earlier, there are some excellent multimedia and web-based language learning options these days but if you have the motivation and imagination I believe you can go a long way with the FSI Language Courses (as generations of diplomats have – and its hard to beat the price). Have you ever applied for a job? Were you hoping to actually get an interview and then maybe a job – or was the application process just something you were going through to “prove” to someone that you were “looking”, “making an effort”? I know it sounds crazy, but I think that some people have such a great fear of an interview, or maybe of actually getting a job, that they ensure that their application has no chance of getting noticed (in a positive way)! By doing so, there is no chance they will get contacted for an interview and no way they are actually going to get a job. I would hope this is their motivation but just in case there are people out there who are accidentally making a couple of common mistakes, I am sharing my observations. incorrect job (or company!) referred to (no doubt a result of a copy and paste from a previous application) – BAD! I may overlook one little typo, but usually if there is a big stack of applications to go through, there are no second chances. I would expect candidates to be showing their absolute best through the hiring process but if they are not paying attention to details here, they are going to end up costing me time and money if they were ever hired! The second must-have characteristc for any job is analytical ability. I need someone who can look at a situation , analyze something and then take action. I am amazed by the number of applications that I have reviewed where the candidate appears to have not even read the full job description. It seems that they have read just the first two words of the job title, and decided the job fit them perfectly. I expect someone to have read the job description fully (a number of times). I expect the candidate to demonstrate their understanding of my job’s requirements by showing (in their cover letter and resume) how they meet each of the requirements. If the candidate doesn’t meet each of the requirements (and rarely does any candidate meet them all), then the applicant must analyze the job requirements, analyze their experiences and make a case that they can/will come close to meeting the job requirements. These two characteristics, attention-to-detail and analytical-ability, won’t guarantee you a job offer, but believe me, an obvious demonstration of a lack of these characteristics will fast-track your application to the “Reviewed, will NOT interview” pile. So, if you are going to bother to apply for a job, do it right or else don’t waste your time and that of the Human Resources department and hiring manager! Today, a book arrived in the mail. I have been anxiously awaiting it since placing my order last week. Why did I order it, why am I anxious to get it in my hands? I already had the book – in audio format and I have listened to it and loved it. It is a one of a few audio books that I really thought I would benefit from having a hard copy. I like hard copies for the ability to easily go back and forth to tie pieces together in my mind. I am a visual learner so seeing the words , as well as any diagrams and tables will help me make the info my own. I also like the ability to highlight and make notes right there in the text. So what is this book that I am referring to? 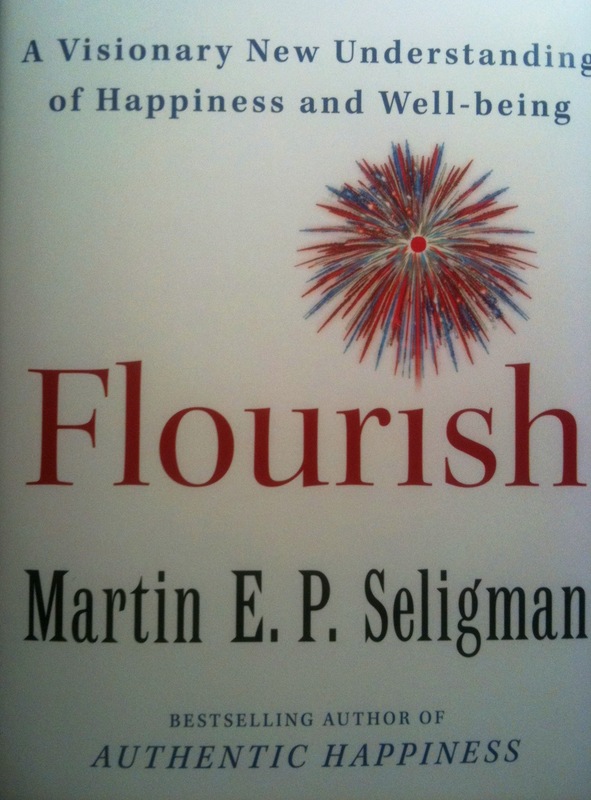 It is entitled, Flourish, A Visionary New Understanding of Happiness and Well-being by Martin E.P. Seligman. This book was published in April 2011 by Free Press. Seligman had five other books, I believe all on the central theme of this book: positive psychology. The revolutionary premise is that psychology should look at what makes people happy and functional and promote these things rather than, as has traditionally been the case, focusing on all of the negatives and at best hoping to deliver people to a neutral state after eliminating those negatives. Through this perspective people can not just survive and exist but actually flourish! The book includes some psychological tests, the type where you rate a statement on a 1 to 5 scale and end up with some revelation about yourself. These and a number of other assessment tools can also be accessed through Seligman’s Authentic Happiness website. One of the key concepts discussed in the book is PERMA – the five pillars of positive psychology. PERMA stands for Positive emotion, Engagement, Relationships, Meaning and Accomplishment.. The book goes into the relationships between positive mental perspectives and physical health (for example lowered incidence of Cardio Vascular Disease. For more (and probably better) info on this book I refer you to this post on the Brain Pickings blog. This week I’ve been listening to the audio version of the book “Talent is Overrated, What Really Separates World-Class Performers from Everyone Else” by Geoff Colvin. Although I am not quite finished this book I do not hesitate to recommend it. The talent that Colvin refers to is a genetic pre-disposition to excel at something – the “born-with-it” factor. In this book the author strives to (and succeeds in my mind) to demonstrate that anyone who has become a world-class performer (whether in the arts, sports or business) has got to that point by practice – lots and lots of quality practice. I found very interesting how Colvin presents the early life stories of two individuals (Mozart and Tiger Woods) who so many people believe must have just been “born with it” – obvious child prodigies, destined to excel. Colvin makes the argument that these two became masters at early ages simply because they practiced and practiced. They both started very early in their lives and both benefited from a parent/teacher who were able to guide their practice to make their practice time most productive. In the end though, they simply put in comparable numbers of practice hours to anyone else who has become a world class performer. A key concept of the book is the concept of “deliberate practice” (calculated, focused practice on the minutia of the activity). Going through the motions and calling it practice, just won’t benefit you. The author explains the value of having a teacher/coach to guide that practice. Colvin gives a good example of the casual golfer who goes to the range to hit a bucket of ball for “practice” but points out how really unproductive this type of activity usually is. This revelation that talent is not genetic and that practice is the key, is comforting and inspiring to anyone who has wondered if they should even bother trying to learn anything new. Colvin does however point out the difficulty of getting in the necessary hours of practice to become “world class” when you have a life to live. He also states that this deliberate practice is not likely to be fun. It will be hard work including considerable mental concentration in addition to whatever the physical demands of the activity you are attempting to master. If you are on a mission to grow, to master anything, even if not to the level of being world class, this book is worth a read or listen. It is both inspiring and helpful. You can get better – without magic and without having been “born-with-it”. Miserable Jobs – is there a solution? I’ve been listening to an audiobook this weekend and it has struck a chord with what I think about job satisfaction, so I want to share it with you. The book is not new, in fact it came out in 2007. The book is The Three Signs of a Miserable Job by Patrick Lencioni. As with five other books by Lencioni, this one is presented in the form of a fable, a fictional tale. This makes the content immensely listenable and therefore the message is easy to absorb . Lencioni follows up the fable with a summary of the key points. anonymity – the employee feels unknown by their manager and not personally recognized by the organization. irrelevance – the employee does not know who their work impacts or how. While I agree with what this book says there is one aspect which I feel worth emphasizing. When it comes to making a job measurable it is very important to have meaningful metrics. The measures must pertain to the service the job offers to those who are served. I believe that the counting of meaningless things just because they can be easily counted could indeed be counterproductive and indeed contribute to an employee’s feeling of irrelevance. Lencioni makes the point that all these factors seem to be just common sense, but nonetheless they are largely ignored even thought dealing with them is relatively straight forward. This book is directed mainly at managers and it applies equally to all managers of people, from frontline supervisors to CEOs. The content is however also of interest and valuable to anyone who works in a job. If all else fails, if your managers aren’t looking out for you, you can and have to take your job satisfaction onto your own hands as best you can – and if that means finding another job, this book will give you ideas of what to look for so you don’t end up in another miserable job. by reading or listening to the book. As I opened off saying, I liked this book and fully expect I will be giving it a repeat listen in the not too distant future.